In previous articles, we’ve discussed the steps involved in buying a business including how to analyze a business and making the written offer. 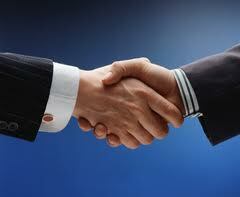 Once the initial written offer has been made, the transaction usually enters the negotiation phase. The negotiation phase is really not complicated. Most likely you’ve already bought a car and/or a home. The negotiations over the price of a business are similar. The initial offer is usually lower than you actually think you’ll wind up buying or selling the business for. More than likely, there will be a counter offer to the original offer. You can then accept this figure or continue the ping-pong match with additional counter offers until a number is reached that is acceptable to both parties. If you are a cash buyer, you’re in a stronger position to bargain on price. If you’re asking the seller to finance a significant portion of the purchase price, you still have some room to negotiate but maybe not quite as much. If it is not a distress sale, don’t expect to buy the business at a distress sale price. If it is a distress sale, the business is worth the depreciated value of the furniture, fixtures, equipment and inventory. If you’re going through a business broker, use him. He’s been involved in similar negotiations dozens of times before. At each step of the negotiations, ask him for his thoughts. You don’t have to take his advice, but asking for his input could be advantageous. Don’t be “penny wise and pound foolish.” (Is that the right cliché?) Well anyway, you know what I mean. Don’t “lose the kingdom for want of a.… (Now I’m in trouble. I’ve forgotten the rest of that one!) I think you get the point. Relax as much as possible and always stay professional. Never loose your cool. By now, you’re getting pretty close to landing your own business! Once you have come to an agreement on price and terms, move on to the next phase with all deliberate speed. The next phase is the due diligence investigation and is covered in my next post. And the businesses offered for sale by William Bruce may be viewed at www.WilliamBruce.net. This entry was posted in Business Valuation & Appraisal, Buying or Selling a Business and tagged business broker, business purchase negotiations, buy a business, buying a business, negotiating to buy business, negotiations to buy business, sale a business, Sell a Business, William Bruce Sunbelt Business Brokers. Bookmark the permalink. Just a question, as I’ve been reading your other post regarding valuation rule of thumb for restaurants/bars (1.5x to 2.5x ODCF): do you have a similar rule of thumb for where to put the opening bid for a buyer? For example, one franchise business I am interested in has set the seller’s price @ 2.2x ODCF, or 40% gross revenue. Do you recommend an opening offer similar to the 10% off list that is used when buying real estate, or something lower/higher? Would offering 1.5x ODCF be too low? JT, thanks for coming by. I’d say to appraise what you think would be market value for the business, and then make an opening offer of about 80% of that amount for negotiating purposes. There are a lot of businesses for sale where the initial asking pricing is highly inflated, so I wouldn’t work off of the asking price to calculate an initial offer. I have been given the opportunity to purchase a boutique. The owner is asking $40,000 and wants all money at signing. She is asking this much because it is the value of the inventory at wholesale cost. The business is just turning a year old and proper records have not been kept and there is no profit and loss reports. I started working at the establishment back in November and got her set up with a POS system that keeps track of sales, inventory, etc. The business is growing and I can see the potential but I am so nervous that the amount she is asking is too high. I need help, please.